Hello friends. 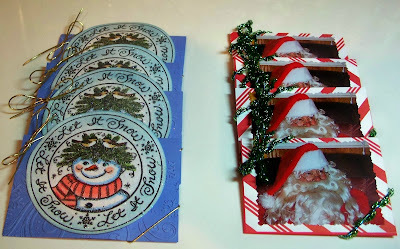 I have been busy putting together some small gifts for four of my high school friends. 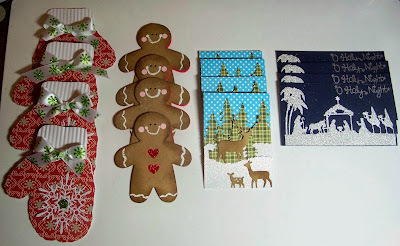 They are coming to lunch in December at my house and I wanted to give them each a few little handmade items. The last time we met at a restaurant for lunch and I took them each six cards. They loved them so much, I thought I would do it again. I made a beautiful card from a picture I downloaded from the internet, it is Santa kneeling at the manger. I have a small figurine that the hubs bought me years ago after I admired it in a jewelry store. The picture is copyrighted, so I can't show you, but it turned out so beautiful. he arrived and how they reacted with him. It's a beautiful picture too. wow these are gorgeous Sue and so beautiful made. Hi Sue, I just love opening your blog page to see that wonderful waterfall, cheers me up no end. I love the idea of the Santa School your frient went to, fantastic to think there is such a place. Your little tags are beautiful, and such a thoughtful gift for your friends. Wow you have been busy, creating some very nice items. That is so nice that you and your friends still get together. Know what you mean about time. I don't think a 48 hour day would even help. Well enjoy this day. Oh you do know how to treat your friends girl! Super creations just in time for the holidays!